Extra deep heel cup helps cushion the foot naturally by utilizing the cushioning tissues in the heel of the foot. Tapered toe design provides better fit in all athletic shoes. Molded air channels are designed to move warm air out and draw cooler air towards the foot, keeping feet comfortable and dry. 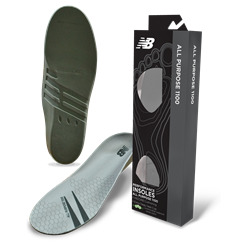 The All Purpose Cushion insole delivers long lasting comfort because it is lightweight and durable. It does not harden like PVC foam, breakdown like latex foam, or take a compression set like EVA foam.